I absolutely love oatmeal. I eat it every day. So when I first saw the little container of Vigilant Eats Superfood Oat-Based Cereal, I was intrigued. This cereal was developed by Doug Seigel who originally developed it for himself. 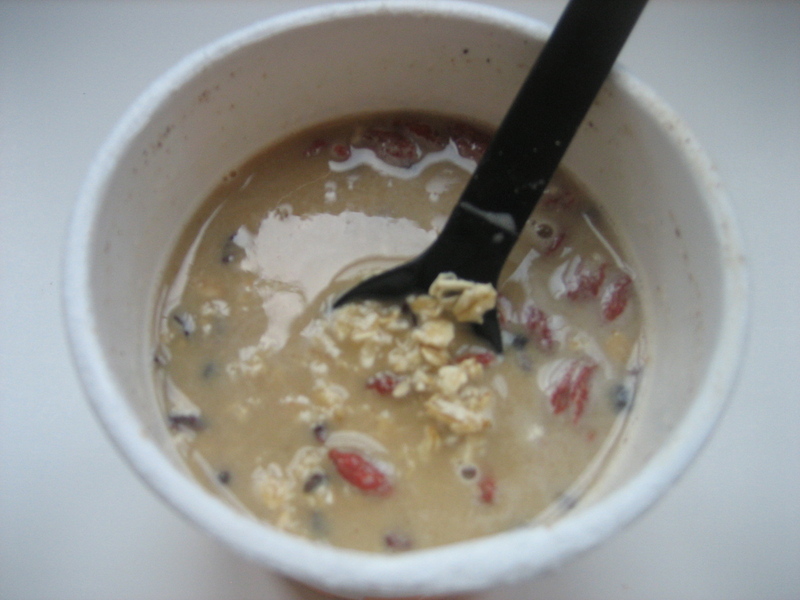 He wanted to make a high-protein, low-glycemic, nutrient-dense cereal that tasted great. I would say he has succeeded. To prepare it, just add cold water to the container. Yep, cold water. I was a bit skeptical that it would be good like this, but I can assure you that it is! This cereal is delicious. I don't typically like gluten-free oats, but in this cereal, they were great. It is made with gluten-free oat flour, coconut palm sugar, goji berries, cacao nibs, maple syrup powder, hemp flour, yacon, and cinnamon. This cereal was loaded with cacao and goji berries, which was unexpected as most manufacturers only add a little bit of the nutritious stuff! The sweet cinnamon and coconut palm sugar added just the right sweetness and spice. The other thing I love about it is that it is perfect to eat on-the-go as the spoon is included! The only thing I didn't love about it is that it is 300 calories and 7 grams of fat so it is pretty high in calories and fat for a small bowl of oatmeal. That said, everything in it is good for you and it is certified organic, gluten-free, non-GMO, and vegan. It is also high in fiber and low in sugar. This cereal is incredibly delicious and I'd love to get my hands on more. To find a store near you that sells Vigilant Eats, click here. Ah...but look at what types of fat are in this. Nothing here is BAD fat!